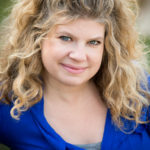 This summer, at NerdCampKansas, I met author Marcie Colleen and, as children’s book people tend to do, formed an instant bond (and wished we didn’t live half a continent from one another). While visiting, I was lucky enough to get a peek at the F&G of her latest picture book, PENGUINAUT! (Scholastic), with illustrations by Emma Yarlett. The cuteness just oozed off the pages, and I knew I wanted to talk about the book here on PBB. Poor little Orville. He watches as his BIG zoo friends have BIG adventures, and OF COURSE he longs to have an adventure of his own. What does he come up with? Why, flying to the moon! When he announces his BIG plan to his friends, do they ooh and ahh? Offer helpful suggestions? A little muscle power, perhaps? Stung, Orville decides to go it alone. And, whew, it’s harder than he’d anticipated. The language throughout his “building” phase is so fun to read aloud. Oh! And his propulsion method? Shaken soda. Too funny! And don’t you LOVE Yarlett’s goofy illustrations?! They match the story’s tone so perfectly. He even shouts out to the dark universe: “I’m doing it myself!” “…but his tiny voice was swallowed up in the starry blackness.” I love the spread that follows, his “moment of truth,” when, just as he’s feeling queasy, and even “his spacesuit grew squeezer,” a note from his friends falls from his pocket, a note offering their love and encouragement. Okay, not giving away any more of this touching friendship story. You’ll just have to see it for yourself. Marcie was kind enough to consent to an interview. JE: Can you recall how you came up with the idea of a small penguin longing for a BIG adventure? JE: Isn’t it crazy how ideas so often just ping into your head? Did you intend the be-careful-what-you-wish-for theme from the beginning, or did that sneak into the story as you wrote? MC: Interesting, I don’t see it as a careful-what-you-wish-for theme. I see it more as a story of independence and persistence, but also learning that sharing the voyage with others can be twice as rewarding. I think Orville comes to realize that his friends weren’t in competition with him or trying to hold him back, as he had originally perceived. In fact, his friends were cheering him on, in both his solo pursuits and in group activities. So, often we think everyone is in competition with us and it keeps us from enjoying the accomplishments and camaraderie that can come from cooperation. But I also think that Orville needed to go on this journey alone, not to prove to anyone else that he could, but to boost his own confidence and prove to himself that he is capable of greatness. JE: Funny how people see different themes in our books that we don’t! Tell us a bit about your other published books. MC: I am also the author of the Super Happy Party Bears chapter book series about the Super Happy Party Bears who love to sing and dance and party all the time and only eat doughnuts. But they live in the Grumpy Woods where no one wants them to do any of those things. There are currently eight books in the series and they are chockfull of color illustrations and wacky humor. 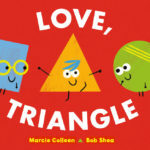 I am also the author of Love, Triangle, a picture book illustrated by Bob Shea, about Circle and Square who are best friends until an awesome Triangle shows up. Then they both decide they might rather be best friends with him. Love, Triangle was named a Banks Street Education Best Children’s Book of 2018 in the Humor category! 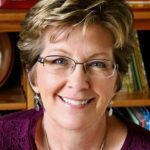 JE: How do you shift gears when moving between chapter book projects and picture book projects? Is that even necessary, or does it just flow naturally? Is there some mindset you need to find, etc? 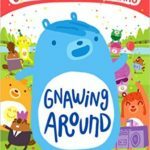 When I was writing the Super Happy Party Bears, I would often read some of the previous books before diving back into the world. It would be a way to re-acclimate to the Grumpy Woods. But, with all my writing projects, I refer to a stack of mentor texts, as well as mentor cartoons!! These books and cartoons contain a similar voice or encapsulate a feel of the story I am currently working on, so I’ll curl up for about a half hour before delving into any project and read, or watch, one of these books or cartoons. It’s an instant “in” for me. JE: Sounds like the perfect combination to get back into the right head space. I love the idea of “mentor cartoons!” My afternoon has now been planned. What’s next for you, book-wise? 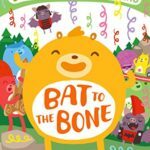 MC: My next picture book comes out in Winter 2020 from Macmillan. It’s called The Bear’s Garden and it will be illustrated by Alison Oliver (Moon, BabyLit series). It’s about an intrepid girl, her beloved stuffed bear, and the garden they create in a forgotten corner of their neighborhood. It is inspired by a real community garden in Brooklyn, New York and it’s so wonderful to see my former neighborhood come to life through Alison’s gorgeous art. It truly will be a love letter to the place both Alison and I have called home. JE: Thanks so much, Marcie! Hope to run into you again soon! The WINNER of Beth Anderson’s AN INCONVENIENT ALPHABET was Danielle Dufayet. 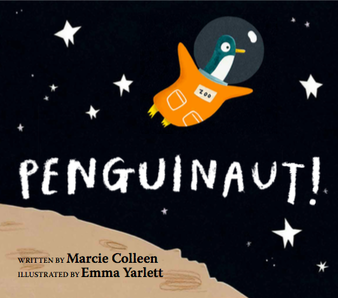 book giveaway, Emma Yarlett, Heart, humor, Jill Esbaum, Marcie Colleen, Penguinaut!, picture book, Scholastic. Bookmark. Great interview, Marcie and Jill! Penguinaut is darling! I can’t wait to plunge into space wth Penguinaut! Love the language play Marcie has in the spreads you shared, Jill. Love how Marcie pursued the “what if” to create this story. Happy Thanksgiving to you and Marcie an your families. Thank you, Kathy! You know I love some good word play. Its a bit more gentle in PENGUINAUT! than in my previous books, but its part of my work nonetheless. As soon as I read the line “Orville flippered out”, I knew I needed this book. Such a great line! And so much fun language throughout. Thanks for sharing it with us! Thanks, Becky! I love making up my own words! I am glad you enjoyed it. Wow! Thanks, Tracy! I am certainly glad you think that. This was a great interview. Love that this project began out of the magical cauldron of “what if.” 39 drafts! That is really encouraging to hear for a young buck like me. The lesson I am learning is, when is a story is “ready?” I don’t believe I’ve found that sweet spot yet, and have (to my shame) queried stories that were far underdeveloped. Nice to hear that it pays to be patient and to put in the time and work to make it work. I have a question about formatting a MS when it comes to spoken dialogue from an ensemble. The other animals have speech bubbles but did Marcie determine who said what or was it Emma? Did Marcie just offer the dialogue and then Emma paired the speech with a character she wanted to include? I guess I’m wondering in this particular text how specific were Marcie’s artist notes and what that process looked like. Brian, for this particular book I simply listed some dialogue responses from Orville’s friends because it wasn’t necessary, I thought, to assign them to certain animals. And then Emma assigned them as she wished. But in previous books, I write dialogue for speech bubbles as in a script. Hope this helps. And keep up the good work. It will pay off for sure! Enjoyed the interview and looking forward to reading the book. Thanks, Michele! I hope you enjoy the adventure. Wonderful interview! I’ll be looking for Penguinaut! I love the illustrations and fun, read aloud text! Congrats, Marcie! Thanks, Judy! Read-aloud-ability is the key to writing for this age group. I do hope you enjoy it. Love this book to the moon and back. Great interview! Aw! I love YOU to the moon and back, Wendy! Thanks for stopping by. This book will be like a shining star on a child’s shelf – to be read and enjoyed over and over again! I sure hope so, Danielle! Thanks for stopping by. That is the beauty of writing and publishing, right? It is open for others to interpret. I look forward to meeting Orville! Thank you, Marcie and Jill, for this informative interview! I can’t wait to see this charming book that will definitely be in my local library. All the best to you both! Thank you, Anne! Libraries are out of this world! Great interview, Marcie and Jill! I love Orville’s persistence and his fantastic flight. This story is a blast to read aloud and absolutely adorable. Congrats, Marcie! Great interview! And I was wondering if you wrote the text for the speech bubbles, too, so I’m glad you answered above 🙂 This looks adorable! Adorable! Congratulations! So very creative. Love the title, the characters, the illustrations, and the far out dream! Love Orville to the moon and back! Can’t wait to have my very own copy of PENGUINAUT! I loved this interview and how the idea sparked. Penguins have no necks, lol!!! Marcie, You are the best! Thanks, Jill for this interview.